The 6th Duke of Devonshire owned a large collection of exotic animals, among them an Indian bull, a Neapolitan pig, and a Peruvian llama. One of the star attractions was Saidi, an Indian elephant, whose tricks included using her trunk to sweep with a broom and to uncork a bottle. She also gave rides around the lawn. She was buried in the grounds in 1829, although her bones have not yet been found. The Duke may have collected animals to keep him company as despite being a very eligible bachelor, he never married. 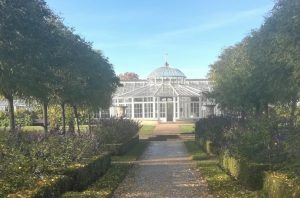 The Bachelor Duke also built the conservatory here at Chiswick, which housed his collection of camellias from the 1820s. The conservatory has now been restored and it still contains a world-famous collection of camellias. As you cross the lawn, you will soon approach another original feature of Lord Burlington’s garden: the Inigo Jones gateway.